I remember learning at University about the intricate mechanisms involved in embryonic development. So many processes have to happen at just the right time, in just the right order, and in just the right amount to produce — for example — five separate digits on the end of the hand that it amazed me that any of us are born with the ‘standard’ body plan at all. Since I started fitting patterns, and more recently drafting patterns myself from scratch, I’ve been experiencing the same kind of wonderment: how did I ever buy anything ready made that even vaguely fitted me, when there are so many variables to account for? This second version of my self-drafted shirt pattern is a case in point. The first version went very well, but the shoulders and armholes needed a bit more work. I suspected that I had not allowed enough length along the shoulder, and also that the slope of the shoulder wasn’t quite right. This led to knock-on problems with the shape of the armhole. In addition, I wanted to reduce the sleeve cap height, so that the sleeve cap was flatter, allowed easier movement of the arm, and also made it easier to sew a flat-felled seam for the sleeve. It has taken me a while to understand how the shape and height of the sleeve cap relates to the angle of the sleeve and its width, but this excellent explanation finally allowed the penny to drop. First, I re-measured my shoulder length accurately. The next problem was how to measure the angle of slope of my shoulder from the horizontal. I’m sure that we have a protractor lurking around the house somewhere, but rummaging around in a few drawers didn’t turn it up, so I had to think again. I realised that I could take a photo of myself standing with my shoulders as level as possible, and then import it into a vector drawing programme. On the image, I drew a line following the slope of my shoulder, a horizontal line originating at the neck point, and then a perpendicular line joining the two lines at the end of shoulder to form a right angled triangle. Since I knew the length of my shoulder in real life, I could use it as a scale to measure of the length of the other two lines on the image, and then use this to draft a shoulder line on my pattern of the correct length and angle. Incredibly, this crazy plan actually worked. Hooray for geometry! Once I had sorted out the shoulder, I re-drew the armhole shape and found that it made a much more conventional shape than last time, which was reassuring. Finally, I drafted a new sleeve pattern, using the new armhole measurements, and with a lower sleeve cap height to make the top of the sleeve flatter. The other changes I made to my previous pattern were to do with design rather than fit. I wanted a summery shirt, so made the sleeves elbow length and drafted a simple split band for the cuff. This was a similar width and shape to the band collar, which I used instead of a full collar. Finally, I added a bit of ease to the side seams to make it a looser, more breezy fit for hotter weather1. I winged it a bit on the construction of the cuffs, and my top-stitching could be a lot neater in places, but the pattern is so busy that you have to be looking pretty closely to see the errors. Overall, I’m really happy with the way that this shirt turned out. It fits like a dream, and the grey-green blobs on the print match perfectly with the colour of my linen Hobbit trousers. My flat-felled seaming technique is improving, and the armhole and sleeve seams worked out very well. I have now transferred the changes to the shoulder line and armhole to my bodice sloper. I think I’ve got a really good basic template now from which to draft new patterns, and I’m gradually gaining confidence in the changes I can make to design different kinds of garments. It’s pretty addictive. 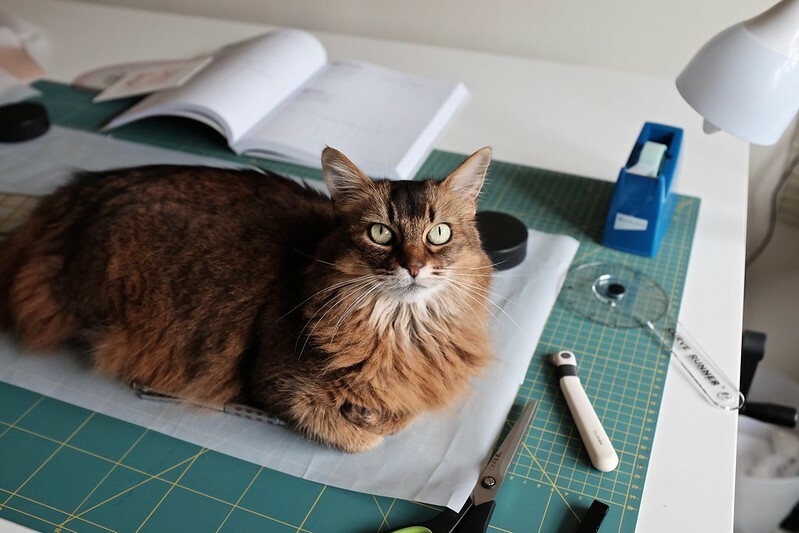 During this process, Bella has become my ‘helpful’ pattern drafting assistant, and sometimes offers herself as a large and fluffy pattern weight.